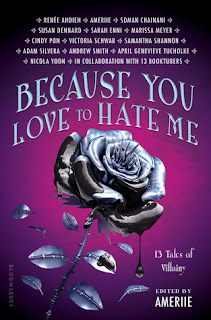 If you follow my bookish rounds, you know that among other YA book news, cover reveals, publishing articles and more, I cover Movie & TV show adaptation news. Well, sometimes it's hard to keep track of all the things that have been optioned week after week. So (!!!) 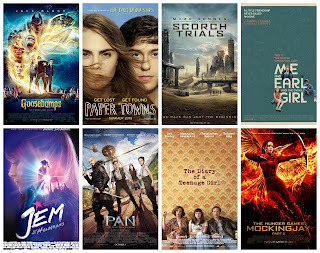 I looked through the past six-seven months of my bookish rounds posts and sorted all the links I'd had for movie & TV show adaptations. It created a fairly concise look at things that were at the "lower" stages in development (i.e. news focused on the option, screenwriter, or director attached), things that were slightly higher in development (i.e. news that included an actor or actress now attached), things that now have a release date (i.e. actually coming soon!! ), and things that have been recently released and we can obtain on DVD. I hope you find this helpful! If you ever make a list of movies or TV shows that you'd like to see, maybe this list can help you (though, also, if so, can you link back here?). 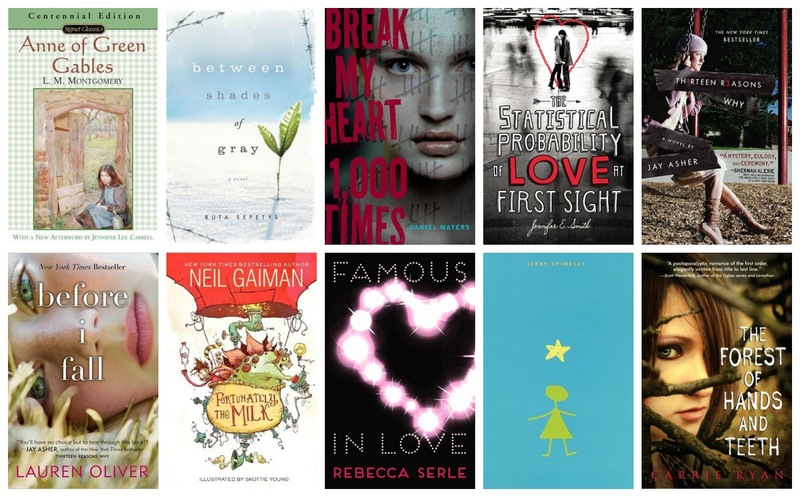 NOTE: THESE ARE NOT ALL THE YA BOOKS THAT HAVE BEEN OPTIONED, etc. These are only the ones with news that I managed to cover in the past six-seven months (undoubtedly, I’ve missed some news articles, and also, many books that have been optioned prior to my arbitrary six month date still have news going for them – like when Wicked Lovely was assigned a director? I think it was…). Point being: just because this is a six-seven month period, doesn't mean older projects won't soon have news articles about their recent developments. The Jenna Fox Chronicles by Mary Pearson (Dolphin Films; screenplay by Garry Williams; producers Bill O'Dowd and Julia Pistor). GOODREADS. Simon vs. The Homo Sapiens Agenda by Becky Albertalli (Fox 2000's Erin Simonoff and Molly Saffron; produced by Wyck Godfrey, Marty Bowen, and Isaac Klausner of Temple Hill, and Pouya Shahbazian and Chris McEwen of New Leaf Literary & Media; script by Isaac Aptaker & Elizabeth Berger). GOODREADS. His Dark Materials by Philip Pullman (BBC commissioned Bad Wolf and New Line Cinema for an initial eight-part TV series; executive produced by Pullman, Tranter and Gardner for Bad Wolf, Toby Emmerich and Carolyn Blackwood for New Line Cinema, and Deborah Forte for Scholastic). GOODREADS. John Connolly's MG Trilogy (The Gates, The Infernals, The Creeps) (Dreamworks; franchise attempt). GOODREADS. The Cruelty by Scott Bergstrom (Paramount; Jerry Bruckheimer on project). GOODREADS. Obsidian by Jennifer Armentrout (financed by Sierra Pictures; produced with Mr. Mudd's Russ Smith and Lianne Halfon; script by Ava Dellaira). GOODREADS. The Descendants 2 / sequel (Disney; writers Sara Parriott and Josann McGibbon). GOODREADS. The Thousandth Floor by Katharine McGee (2017 HarperTeen; ABC; series development by Greg Berlanti and Maggie Friedman; script by Friedman; produced by Berlanti, Berlanti Prods, Sarah Schecter, Leslie Morgenstein, Girolamo). GOODREADS. The Arcana Chronicles by Kresley Cole (TV show by Warner Brothers; Adam Shankman and Jennifer Gibgot from Offspring; written by Seamus Kevin Fahey). GOODREADS. Shatter Me by Tahereh Mafi (TV show by ABC Signature Studios; Mafi as a consulting producer). GOODREADS. Fear Street by R.L. Stine (Sony; reportedly in development for the sequel to Goosebumps). GOODREADS. Forgive Me, Leonard Peacock by Matthew Quick (The Weinstein Company; Channing Tatum & Rein Carolin as directors; Tatum also acting and producing; written by Mike Vukadinovich). GOODREADS. Nancy Drew by Carolyn Keene (TV show by CBS, but Nancy aged into a super-sleuth NYPD detective in her 30s; produced by Joan Rater, Tony Phelan, and Dan Jink; written by Joan Rater and Tony Phelan). GOODREADS. The Scorpio Races by Maggie Stiefvater (Focus Features; produced by David Katzenberg and Seth Grahame-Smith's KatzSmith Productions and Jay Ireland; directed by Matt Sobel; written by Jack Thorne). GOODREADS. Upside-down Magic by Sarah Mlynowski, Lauren Myracle and Emily Jenkins (Disney Channel, for TV). GOODREADS. Mary Poppins by P.L. Travers (director, maybe, Rob Marshal; not many details). GOODREADS. Throne of Glass by Sarah J. Maas (Mark Gordon Company, for TV; no further details). GOODREADS. A Court of Thorns and Roses by Sarah J. Maas (Jo Bamford and Piers Tempest at Tempo Productions). GOODREADS. The Sky Is Everywhere by Jandy Nelson (Warner Brothers and Di Novi Films; produced by Denise Di Novi and Alison Greenspan, Nelson executive producer). GOODREADS. Little Brother by Cory Doctorow (Paramount; produced by Don Murphy, Susan Montford, Cory Kaplan). GOODREADS. The Animorphs series by K.A. Applegate (Universal; no further details because it’s sort of rumored, I guess?). GOODREADS. The Legacy of Kings by Eleanor Herman (Warner Brothers television, Simon Helberg and his wife’s company, Wildline Entertainment; also produced by Cora Olson). GOODREADS. Steelheart by Brandon Sanderson. (Fox; Carter Blanchard overseeing, along with Will Rack for 21 Laps). GOODREADS. Way Down Dark by James Smythe (Studio 8; Chris Goldberg overseeing). GOODREADS. Looking for Alaska by John Green. (Paramount; new news => directed by Becca Thomas). GOODREADS. Everything, Everything by Nicola Yoon (MGM; produced by Les Morgenstein and Elysa Dutton; adapted by J. Mills Goodloe). GOODREADS. Artemis Fowl by Eoin Colfer (Disney; developed & directed by Kenneth Branagh; produced by Harvey Weinstein, Branagh, Judy Huffland; Julie Oh, Tendo Nagenda, Jessica Virtue overseeing; potentially to be written by Conor McPherson). GOODREADS. 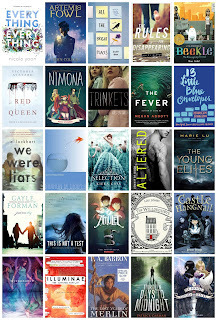 All the Bright Places by Jennifer Niven (old news: financed and produced by Demarest Media; also produced by Paula Mazur and Mitchell Kaplan; directed by Miguel Arteta; Elle Fanning starring as Violet; Lily Lillehaugen and Ally Israelson overseeing; new news: Jennifer Niven writing the screenplay; production to begin in Spring 2016). GOODREADS. Rules for Disappearing by Ashley Elston (Shorelight Pics - not many details). GOODREADS. The Adventures of Beekle: The Unimaginary Friend by Dan Santat (DreamWorks Animation; written and directed by Jason Reitman; developed by Bonnie Arnold and Mireille Soria; Damon Ross and Gregg Taylor overseeing). GOODREADS. Red Queen by Victoria Aveyard (Universal; produced by Jake Weiner, Chris Bender, and JC Spink of Benderspink, and Pouya Shahbazian, and co-produced by Christopher Cosmos; script written by Gennifer Hutchison; new news: potentially directed by Elizabeth Banks). GOODREADS. Nimona by Noelle Stevenson (Fox Animation; directed by Patrick Osborne; attached to write - Marc Haimes; produced by Roy Lee and Adam Stone of Vertigo Entertainment, and John Powers Middleton; Gabriel Chu, Vanessa Morrison, and Darlene Caamano Loquet overseeing). GOODREADS. Trinkets by Kirsten Smith (MTV; created by Kirsten Smith & Andrea Seigel; written by Andrea Siegel; produced by Kirsten Smith, and Morgan Freeman and Dia Sokol Savage of 11th Street Productions). GOODREADS. The Fever by Megan Abott (MTV; developed (and first episode written) by Megan Abott, with Sarah Jessica Parker's Pretty Matches Productions; produced by Karen Rosenfelt). GOODREADS. 13 Little Blue Envelopes by Maureen Johnson (Alloy Entertainment, New Line Cinema; adapted by Harper Dill; Richard Brener, Andrea Johnston overseeing; produced by Les Morgenstein & Elysa Dutton) GOODREADS. We Were Liars by E. Lockhart (Imperative Entertainment; produced by Dan Friedkin, Bradley Thomas, Zak Kadison; Justin Catron overseeing and co-producing; new news: screenplay to be written by Stephanie Shannon). GOODREADS. Out of My Mind by Sharon Draper (EveryWhere Studios and the Gotham Group, partnered with Starlight Children's Foundation as an adviser on the project; produced by Dan Angel, Tom Mazza, Goldsmith-Vein, Lindsay Williams, and Brian Gott). GOODREADS. The Selection by Kiera Cass (Warner Brothers; produced by DiNovi Pictures' Denise DiNovi and Alison Greenspan + Pouya Shahbazian; screenplay to be written by Katie Lovejoy). GOODREADS. The Altered series by Jennifer Rush (Michael Preger and Jillian DeFrehn (from Vampire Academy), with DeFrehn as production executive for Preger Entertainment). GOODREADS. The Young Elites by Marie Lu (Fox & Temple Hill; produced by Marty Bowen and Wyck Godfrey). GOODREADS. Just One Day/Just One Year by Gayle Forman (Universal; produced by Josh Schwartz and Stephanie Savage, and Lis Rowinski and Gayle Forman as executive producers; new news: screenplay to be written by Isaac Aptaker and Elizabeth Berger). GOODREADS. This Is Not a Test by Courtney Summers (in development at Sony TV). GOODREADS. Amulet by Kazu Kibuishi (Fox and Temple Hill; produced by Marty Bowen and Wyck Godfrey). GOODREADS. The Willoughbys by Lois Lowry (Bron Animation; adapted by Kris Pearn; directed and co-written by Adam Wood; produced by Aaron Gilbert and Lewis Carroll). GOODREADS. Castle Hangnail by Ursula Vernon (Disney; produced by Ellen DeGeneres and Jeff Kleeman at A Very Good Production; Sam Dickerman overseeing). GOODREADS. Dissonance by Erica Rourke (Envision Media Arts; produced by Jennifer Quintenz, Lee Nelson, David Buelow, and David Tish and Beaux Carson as executive producers; screenplay to be written by YA author Jennifer Quintenz). GOODREADS. Illuminae by Jay Kristoff and Amie Kaufman (optioned/to be adapted by Brad Pitt’s production company, Plan B). GOODREADS. The Merlin saga by T.A. Barron (Disney; screenplay to be written by Philippa Boyens). GOODREADS. 13 Days to Midnight by Patrick Carman (Bold Films financing and producing; screenplay to be written by Kate Siegel and Mike Flanagan; developed and produced by Trevor Macy at Intrepid Pictures, and Michel Litvak producing for Bold Films, and Gary Walters and Marc Evans executive producing). GOODREADS. The School for Good and Evil by Soman Chainani (Movie from Universal Studios, produced by Joe Roth and Jane Startz; launched, EverNeverTV, a Youtube channel as well). GOODREADS. IMDB. 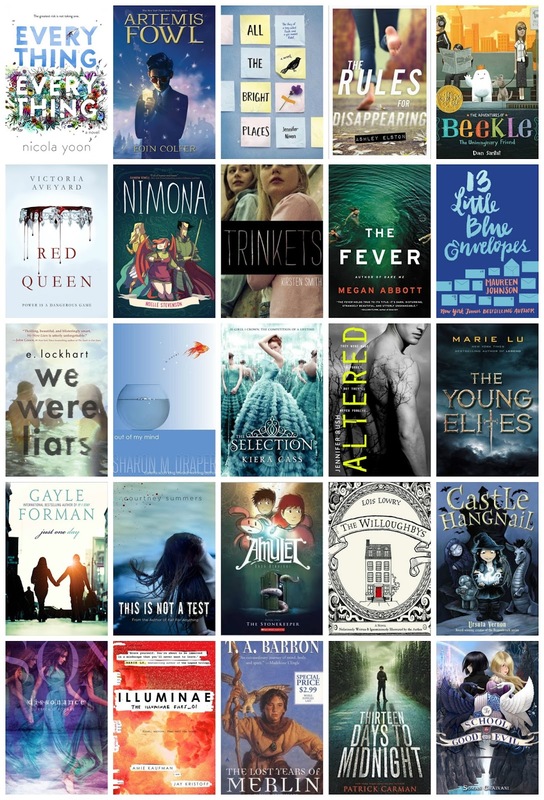 Suggested 2016 by the author's twitter & book trailer article on MTV. A Series of Unfortunate Events by Lemony Snicket (A Netflix series; directed by Barry Sonnenfeld; executive produced by showrunner Mark Hudis). GOODREADS. IMDB. Netflix poster for A Series of Unfortunate Events. Article suggests late 2016. Wonderstruck by Brian Selznick (written and developed by Todd Haynes, who has been joined by Julianne Moore; produced by Christine Vachon, Pam Koffler, and John Sloss). GOODREADS. IMDB. --> These are the adaptations where at least one actor has been tapped. To me, this is probably an indication that these are further along in the stage than those listed above (though, certainly, I imagine that's not always the case). Anne of Green Gables by L.M. Montgomery (Breakthrough Entertainment; script written by Susan Coyne; executive produced by Kate Butler; Martin Sheen to play Matthew Cuthbert while Ella Ballentine plays Anne Shirley, and Sara Botsford plays Marilla Cuthbert). GOODREADS. IMDB (& the article) suggest an early 2016 release date. Between Shades of Grey by Ruta Sepetys (which is called Ashes in the Snow for the movie -- Bel Powley is going to play Lina. Directed by Marius Markevicius. Produced by Markevicius, Jonathan Schwartz of Super Crispy Entertainment and Zilvinas Naujokas of Taurus Films; adapted by Ben York Jones). GOODREADS. IMDB suggests 2016. Break My Heart 1,000 Times by Daniel Waters (Gold Circle Films; adapted by Jason Fuchs; directed by Scott Speer; and Hailee Steinfeld cast as the lead). GOODREADS. IMDB (maybe?). The Statistical Probability of Love at First Sight by Jennifer Smith (Dustin Lance Black executive producer, director, and screenplay writer, Bruna Papandrea, Caroline Kaplan, and Steve Hutensky producers; Robert Sheehan and Hailee Steinfeld to play Oliver and Hadley). GOODREADS. IMDB. 13 Reasons Why by Jay Asher (13-episode, straight-to-series order from Netflix; Selena Gomez is executive producing along with Mandy Teefey, Kristel Laiblin, and Anonymous Contest; pilot written by Brian Yorkey). GOODREADS. IMDB. Before I Fall by Lauren Oliver (other article here, here, and here; Awesomeness Films. cast includes: Zoey Deustch (Samantha), Jennifer Beals (Sam's mom), Halston Sage, Logan Miller, Kian Lawley, and Liv Hewson (Anna Cartullo); and also Diego Boneta and Elena Kampouris; directed by Ry Russo-Young; script by Maria Maggenti, and revised by Gina Prince-Blythewood; produced by Brian Robbins, Matt Kaplan, and Jon Shestack.). GOODREADS. IMDB suggests 2016; article said production started last month. Famous in Love by Rebecca Serle (Warner Horizon Television -- ABC Family/Freeform; casting includes: Bella Thorne (Paige), Carter Jenkins (Rainer), Jesse Henderson (Jake), Keith Powers (Jordan), and Niki Koss (Alexis). TV pilot directed by Miguel Arteta; executive produced by Arteta, Marlene King, and Dan Farah, and co-executive produced by Rebecca Serle; written by Rebecca Serle and Marlene King). GOODREADS. IMDB. Stargirl by Jerry Spinelli (directed by Catherine Hardwicke; screenplay written by Kristin Hahn; produced by Gotham Group, Hahnscape Entertainment, and BCDF Pictures; starring Joey King & Charlie Plummer as the leads, Stargirl and Leo.). GOODREADS. IMDB suggests 2016. The Forest of Hands and Teeth by Carrie Ryan (Kate Maberly's and Chester Semel's Hetherwood Productions, and Doug Liman's and Dave Bartis's Hypnotic production company; Maberly adapting, directing, and producing with Liman (also a producer); Maisie Williams is attached as the lead, Mary). GOODREADS. IMDB. Article suggests sometime in 2016. Death Note, a Japanese manga series (Warner Brothers; script by Jeremy Slater; directed by Adam Wingard; Roy Lee, Dan Lin, Jason Hoffs, and Masi Oka producing; Doug Davison and Brian Witten executive producing; casting: Margaret Qualley and Nat Wolff as the female and male leads). GOODREADS. IMDB. When reporting the actual cast, I've only included people who have been cast as characters who have actual names. If it says "lawyer," I'm not including that individual. I'm also not including the people who are the "full cast" list, only the ones that make the front page. Also organized according to release date; soonest is first. The Shadowhunters TV show (The Mortal Instruments by Cassandra Clare). GOODREADS. IMDB. The first episode will be on January 12, 2016 on Freeform (previously ABC Family). Among the cast: Katherine McNamara (Clary), Dominic Sherwood (Jace), Alberto Rosende (Simon Lewis), Emeraude Toubia (Isabelle Lightwood), Matthew Daddario (Alec Lightwood), Harry Shum Jr. (Magnus Bane), Isaiah Mustafa (Luke Garroway), Alan Van Sprang (Valentine Morgenstern), Stephen R. Hart (Brother Jeremiah), Jon Cor (Hodge Starkweather), Alaric (Joel Labelle), Nicola Correia-Damude (Maryse Lightwood). (for others: Jocelyn, Camille Belcourt, Raphael Santiago, Meliorn, Captain Vargas, Ragnor Fell, Robert and Max Lightwood, Lydia Branwell). Also: character posters, main cast poster, Beyond the Shadows: The Making of Shadowhunters, first look at pictures, the first teasers, the second trailer, first promo video, meet Magnus Bane, the 4 minute clip, Directed by McG. The 5th Wave by Rick Yancey (<-- one of the trailers, which you can access at the IMDB link). GOODREADS. IMDB reports that it's being released January 15, 2016. It was written by Susannah Grant, Akiva Goldsman, and Jeff Pinkner, and it's directed by J Blakeson. Among the cast: Chloë Grace Moretz (Cassie), Nick Robinson (Ben Parrish), Liev Schreiber (Colonel Vosch), Maika Monroe (Ringer), Maria Bello (Sergeant Reznik), Ron Livingston (Oliver/Cassie's dad), Maggie Siff (Lisa/Cassie's mom), Tony Revolori (Dumbo), Alex Roe (Evan Walker), Terry Serpico (Hutchfield), Nadji Jeter (Poundcake), Zackary Arthur (Sammy Sullivan), and more. The Divergent Series: Allegiant (part I) by Veronica Roth (<-- one of the trailers that'd been released, but you can also access on IMDB). GOODREADS. IMDB reports that it's being released on March 18, 2016, and it's been written by Noah Oppenheim, Adam Cooper, Bill Collage, and Stephen Chbosky, and directed by Robert Schwentke. In terms of new main cast, they have: Jeff Daniels (David) & Bill Skarsgård (Matthew). Returning are Shailene Woodley (Tris), Theo James (Four), Zoë Kravitz (Christina), Naomi Watts (Evelyn), Miles Teller (Peter), Ansel Elgort (Caleb), Maggie Q (Tori), Jonny Weston (Edgar), Keiynan Lonsdale (Uriah), and more. They’ve changed the title of the final Divergent movie from Allegiant to Ascendant. You can read Veronica Roth’s thoughts here. Tuck Everlasting by Natalie Babbitt (optioned for Broadway; cast includes Broadway veterans Carolee Carmello, Fred Applegate, Andrew Keenan-Bolger, and Terrence Mann. Newcomer: Sarah Charles Lewis as Winnie Foster). Opening in April at the Broadhurst Theatre under "the direction and choreography of Casey Nicholaw." Story by Claudia Shear, music by Chris Miller, lyrics by Nathan Tysen. GOODREADS. The Jungle Book by Rudyard Kipling (<-- the international trailer; you can find on IMDB too). GOODREADS. IMDB reports that it's being released April 15, 2016. It's directed by Jon Favreau, and is written by Justin Marks. Among the cast: Scarlett Johansson (Kaa), Jamie Dornan (Colonel Hathi), Idris Elba (Shere Khan), Bill Murray (Baloo), Giancarlo Esposito (Akela), Christopher Walken (King Louie), Ben Kingsley (Bagheera), Lupita Nyong'o (Raksha), Hannah Tointon (Winifred), Emjay Anthony (Gray), Ralph Ineson (Rama), Neel Sethi (Mowgli), Ritesh Rajan (Mowgli's father), and more. The BFG by Ronald Doahl (<-- the news there had been that Disney was joining Steven Spielberg). GOODREADS. IMDB reports the movie as slated for July 1, 2016. The screenplay has been written by Melissa Mathison, and it's directed by Steven Spielberg. Among the cast: Rebecca Hall (Mary), Bill Hader (Giant), Mark Rylance (The BFG), Penelope Wilton (the Queen), Marilyn Norry (Matron), Ruby Barnhill (Sophie) & more. Harry Potter and the Cursed Child by JK Rowling, Jack Thorne, and John Tiffany (London play July 2016; 8th Potter story told in 2 parts; all the set details and synopsis here). Not much information is available yet! 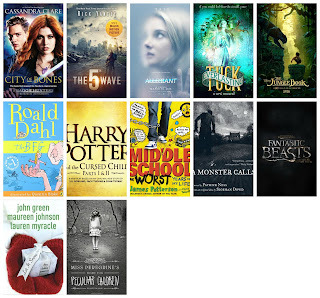 Middle School: The Worst Years of My Life by James Patterson (& other here. CBS Films, Participant Media, and James Patterson Entertainment. Directed by Steve Carr; screenplay by Chris Bowman, Hubbel Palmer, and Kara Holden. Leopoldo Gout and Bill Robinson producing; executive producers include James Patterson and Steve Bowen for James Patterson Entertainment, Jeff Skoll and Jonathan King of Participant Media, & Michael Flynn; Robert Kessel and Scott Shooman overseeing; distributed by Lionsgate as well. Cast includes: Robb Riggle (Jules's boyfriend), Lauren Graham (Rafe's mother Jules), Jacob Hopkins (Rafe), Thomas Barbusca, Andrew Daly, Adam Pally, and Efren Ramirez). GOODREADS. IMDB (& the article) reports that it's being released October 7, 2016. A Monster Calls by Patrick Ness (<-- the new news was the teaser trailer). GOODREADS. IMDB reports A Monster Calls as coming out October 14, 2016. It is starring: Liam Neeson (The Monster), Felicity Jones (the mother), Sigourney Weaver (the grandmother), Toby Kebbell (the dad), Lewis MacDougall (Connor), Frida Palsson (Lily's mum), Jennifer Lim (Miss Kwan), James Melville (Harry), Lily-Rose Aslandogdu (Lily), Max Gabbay (Steven), Joe Curtis (Peter), Oliver Steer (Sully), and more. It has been written by Patrick Ness, and it's being directed by J.A. Bayona. Fantastic Beasts and Where to Find Them by J.K. Rowling (<-- the plot of the movie). GOODREADS. IMDB reports that it's being released on November 18, 2016. It's written by J.K. Rowling (screenplay debut), and directed by David Yates. Among the cast: Eddie Redmayne (New Scamander), Ezra Miller (Credence), Colin Farrell (Graves), Samantha Morton (Mary Lou), Katherine Waterston (Porpentina Goldstein), Dan Fogler (Jacob Kowalski), Alison Sudol (Queenie Goldstein), and more (Gemma Chan, Carmen Ejojo, and Jon Voight; Jenn Murray). More: first look at Fantastic Beasts, more photos here!. The equivalent of Muggle in the States is No Maj). Let It Snow by Maureen Johnson, Lauren Myracle, and John Green (Release date of December 9, 2016; coming from Universal, & the script written by Kay Cannon). GOODREADS. IMDB (watch that space for more info). Miss Peregrine's Home for Peculiar Children (Peculiars) by Ransom Riggs (<-- teaser trailer; movie changed 'Peculiar Children' to 'Peculiars). GOODREADS. IMDB reports that the release date is December 25, 2016. It's being directed by Tim Burton, and is written by Jane Goldman. Among the cast: Eva Green (Miss Peregrine), Samuel Jackson (Barron), Allison Janney (Dr. Golan), Judi Dench (Miss Avocet), Asa Butterfield (Jacob Portman), Chris O'Dowd (Franklin/ Jacob's dad), Ella Purnell (Emma Bloom), Milo Parker (Hugh), Terence Stamp (Abraham/Jacob's Grandpa), O-Lan Jones (Shelley), Pixie Davies (Bronwyn), and more. *I got rid of the individual links for these, and instead linked to IMDB. Since they've been released, you can find information about the trailers, posters, and so on there. Goosebumps by R.L. Stine. GOODREADS. IMDB. (And remember, from above, that they may be adapting his Fear Street books as well. It was also suggested that they'd be making more Goosebumps films, but I haven't seen much news on that account.). Paper Towns by John Green. GOODREADS. IMDB. Maze Runner: The Scorch Trials by James Dashner. GOODREADS. IMDB. (Wes Ball will be staying onto direct the last film). You can find out more information about the Twilight Stories: New Voices of the Twilight Saga clips here. Stephenie Meyer & Kristen Stewart honored the women who won the Twilight Shorts. GOODREADS. (Not an actual film - but clearly an expansion off already released content.). Me and Earl and the Dying Girl by Jesse Andrews. GOODREADS. IMDB. Jem and the Holograms by Kelly Thompson & Sophie Campbell. GOODREADS. IMDB. Peter Pan by J.M. Barrie. GOODREADS. IMDB. The Diary of a Teenage Girl by Phoebe Gloeckner. GOODREADS. IMDB. The Hunger Games: Mockingjay Part II by Suzanne Collins. GOODREADS. IMDB. Phew! If there's anything I've learned in looking through all these articles, it's that it takes A LOT OF PEOPLE to get one of these films off the ground! 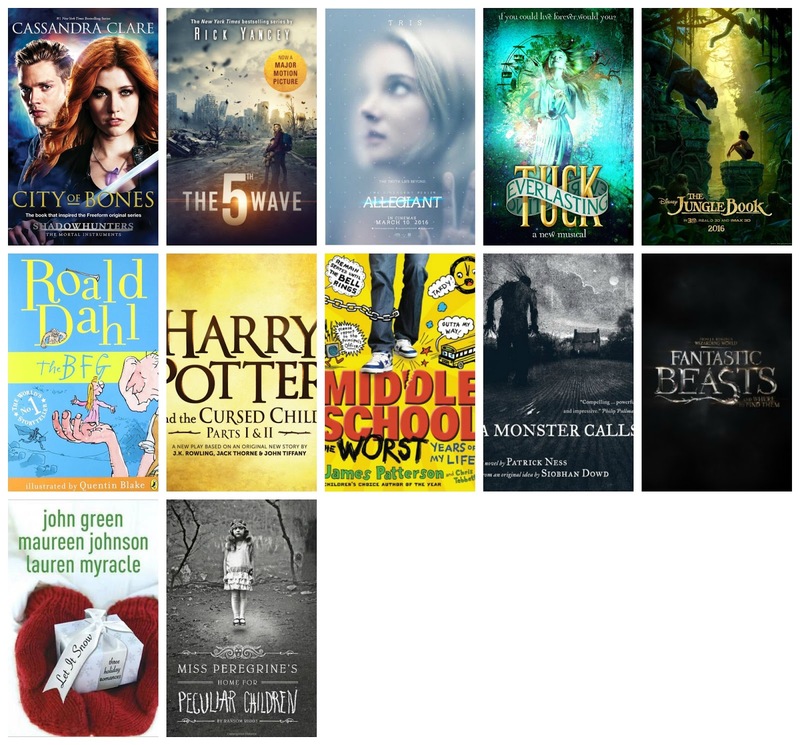 Although this list looks long, I realized too that this is a very select portion of kidlit. 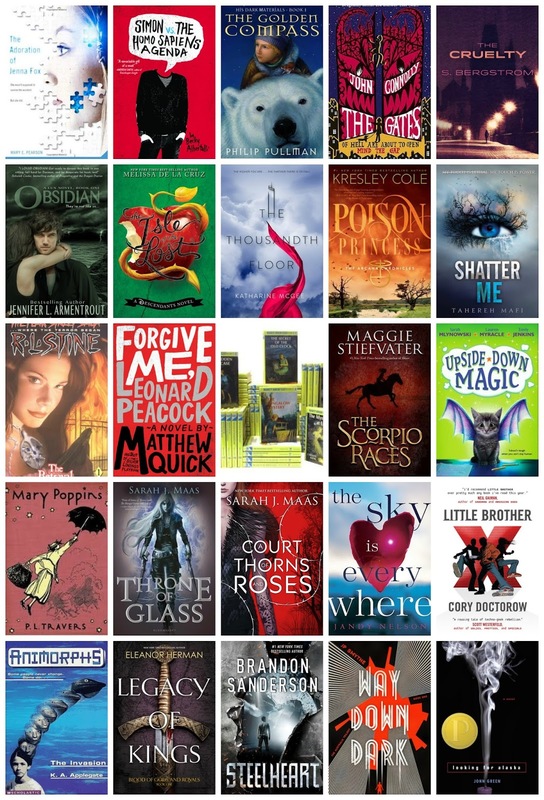 Think of how many books got published in the past 6-7 months, and then look at this list. Still! Really exciting to see the number of news articles! Hurray for YA & MG!! Of the ones with release dates, I'm personally most excited for A Monster Calls and the Broadway production of Tuck Everlasting. I'd honestly forgotten about the adaptation of A Monster Calls, and that teaser looks beautiful. Tuck Everlasting is one of my favorite MG novels, so of course I'm excited. What are you most excited to see soon or see adapted sometime in the future? 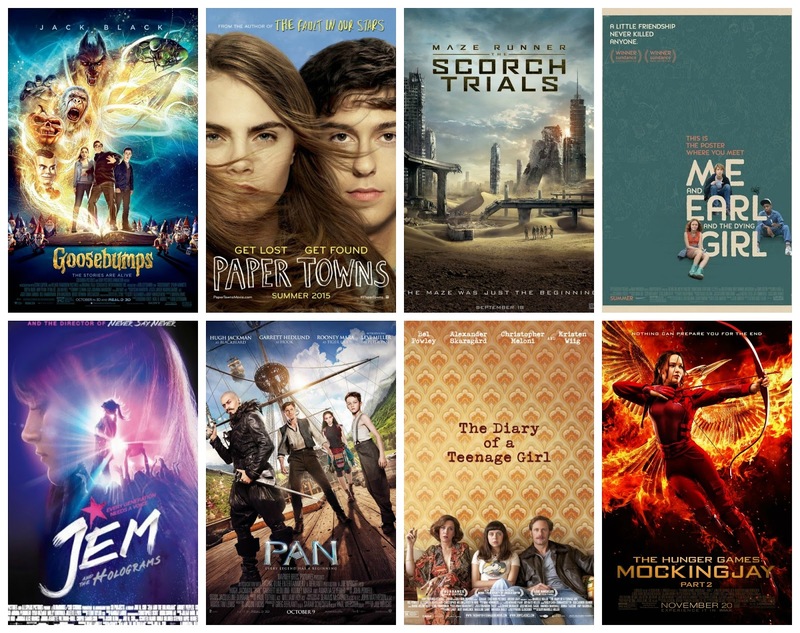 Have you watched all the adaptations that have already been released? Disagree/agree with some casting choices? Let me know! P.S. - Apologies in advance if I mispronounced someone's name. P.P.S. - Looks like I missed this from my last bookish rounds --> "Debby Ryan will be executive producing the adaptation of Megan McCafferty’s Jessica Darling’s It List. Chloe East is playing Jessica Darling, and Blair Fowler is playing Bethany." Should have been under Casting. P.P.P.S. - The 5th Wave is releasing January 22, 2016, NOT January 15th! P.P.P.P.S - Some other adaptation news this might have excludes --> Alice in the Looking Glass & Tarzan, though to be fair, I haven't heard much on either end. But another to keep in mind for 2016 movie releases!